The new Military, like our previous model Turboflame ΠOriginal, is essential for any outdoor enthusiastӳ survival kit, but now with a new soft rubber coating is easy to grip and is offered in military colours. 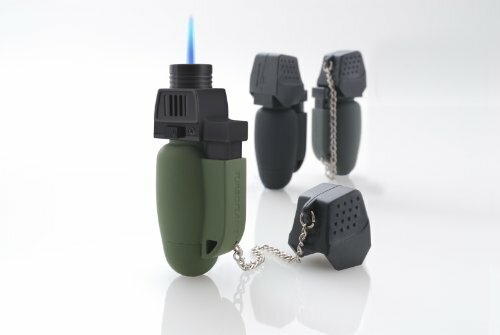 Its jet-like precision flame reaches temperatures up to 1300c and has a lock on flame that makes it a handy pocket blow-torch which can withstand up to 10 minutes of continuous use. Turboflame ңlean burnҠtechnology means it can also melt synthetic materials without depositing black carbon, so outdoor equipment can be quick fixed without discolouration. Outdoor enthusiasts include Turbo flame in their emergency kits to melt p-tex, seal micro – cracks in boards and canoes, cut and seal PARA rope and blast rust from metal. Turboflame work up to 3000 M (12,000 ft) altitiude and doesnӴ ҳelf-combustҠat high altitudes. All in all,Turbo flame is the perfect accompaniment to the pocket-knife and flashlight – a must for any survival kit. This listing is anonymous and will not appear in either the feedback you give or receive.